News / Development / Rialtooooohh boy! Is this 525 Collins Street's redevelopment unveiled? Rialtooooohh boy! Is this 525 Collins Street's redevelopment unveiled? Eureka Tower may have stolen the limelight a few years ago yet for many Rialto Towers at 525 Collins Street is still the quintessential building that's instantly associated with Melbourne. A goliath of its day, the structure jointly designed by Gerard de Preu & Partners plus Perrott Lyon Mathieson was officially opened during October 1986 and for the most has remained unchanged there after. Although owner Grollo Group had at varying times over the proceeding years sought to buy adjoining properties fronting King Street to facilitate further expansion, only recently have signs of redevelopment emerged. First came the render below carried by F2 Architecture on their website. Having a history of work for Grollo Group's development and construction arm Equiset, including 737 Bourke Street Docklands, the well articulated, interactive and open design seen below would have been an impressive fit within the Collins Street vista. Evidently not, as an Australian Financial Review (AFR) article published 6th June 2013 detailed the proposed development. Designed by Woods Bagot Architects, the $45 million dollar expansion would have delivered a six level forecourt building consisting 1,500sqm of retail space and an additional 5,000sqm of office space boosting total office space to an impressive 89,000sqm. Lodged with Melbourne City Council late May, the planning application is now at a referral stage. Interestingly the AFR article states " It is in a planning zone which does not require a permit and the design will not be advertised." Addresses covered by the application include 487-535 Collins Street and 68-70 King Street. Publically advertised or not Equiset have added an image of the Rialto redevelopment within their planning application for 464 Collins Street which lies diagonally opposite, both of which are designed by respected architecture firm Bates Smart. Should this be the new and actual expansion one can't help but feel a little underwhelmed by the design that seemingly breaks a glazed facade with either precast concrete panels or aluminium cladding. Bates Smart commercial projects are always aesthetically pleasing yet generally don't set the world on fire in terms of making a design statement or wow factor for lack of a better term. Speaking as a lover of great design above all else, here's hoping the final, detailed renders when released shows Rialto Towers impending redevelopment in the best possible light given the development will occupy the prime Collins Street and King Street corner. Rialto is an imperious Melbourne building, it's only fitting any redevelopment is of an equal quality. Not a fan really. The first proposal looked more interesting. Pity that in both of them the corner, where the fantastic Robbs Building was demolished, seems to infilled with an extension of the podium. The corner would be the opportunity for a real statement, but it might be just, well, nothing much. Bates Smart design maximizes greatest commercial return for the Grollo's vs F2's much grander statement. I'd hazard a guess that what appear to be solid panels are actually an opaque glazing similar to that on 171 Collins but alternating with a clear glazing. OK after a little more research the image above may or may not be the Woods Bagot design, as opposed to Bates Smart. Either way it doesn't change the disappointing nature of the design. A nice touch for this classy and "iconic" Melbourne development. Thanks, Grollo. Bravo City of Melbourne! How in the world did they miss a C graded building of such significance in the supposedly comprehensive CBD heritage review undertaken only 4 years ago??? Plot Ratios won't save buildings that are not even under heritage overlays. This was approved by the City of Melbourne not the planning minister. 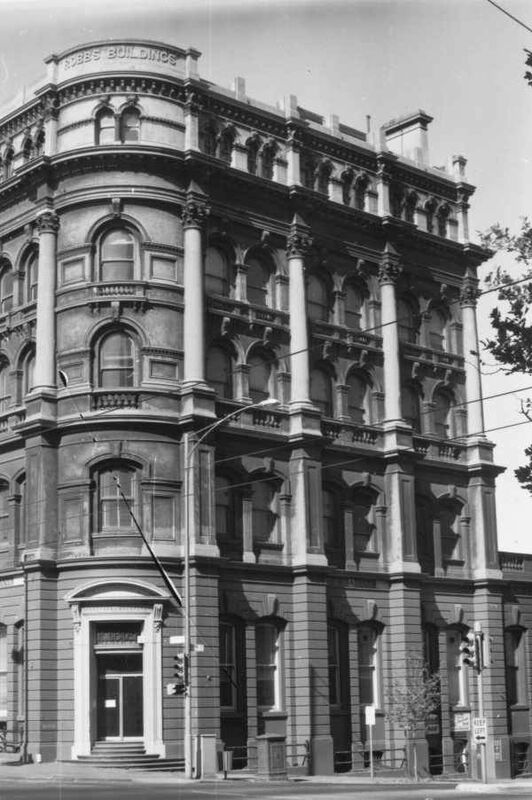 If this had been in place, this building would still be standing - and would not have been allowed to be demolished by wealthy developers looking to leave a "family legacy", rather than respecting Melbourne for what it is, and celebrating and enhancing that unique character. The City of Melbourne can delay the demolition of any building if they think it has heritage values even if it is not under a heritage overlay. Why they decided to allow the demolition of this building anyway is baffling. - All neighborhood buildings at least fifty years of age. - All buildings located in a Neighborhood Design Overlay District. Bet the planner at the city of Melbourne simply saw that there was no HO, and do heritage wasn't an.issue. And yes bilby I couldn't quite bing myself to say it but yes would have been great to see a reproduction of the Robb's building, certainly better than this proposal.